The joy of seeing a child’s eyes light up when they are given a brand-new puppy or kitten is one of the things that makes the holiday season magical. Unfortunately, there are those that will turn that joy to tears. 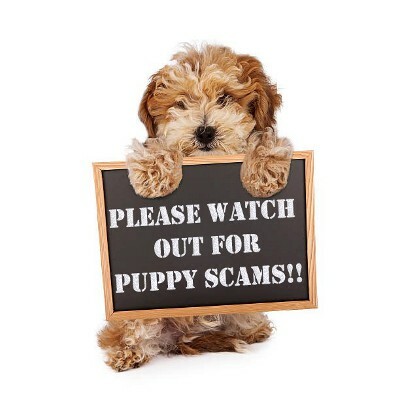 During the holiday season there is a rise in pet scams. Individuals take advantage of those who want to bring a new pet home for the holidays by posting ads for pets that do not exist; they will then exploit a person’s desire to provide their loved ones with a pet for the holidays. The most popular sites for scammers will post puppies and kittens online are Craigslist.org, puppyfinder.com, Oddle.com, Facebook among other sites. In the ad, the scammer will use site information that has been stolen from a legitimate breeder or pet shipper to make it appear that they are a real business. Photos of the puppies are generally stolen from breeders or are stock photos that can be found online. A scammer will claim to work with pet transport companies, have glowing testimonials and the puppy and kitten prices are lower than most breeders. If it looks too good to be true, it probably is. If an ad lists a phone number, give it a call. If the number is disconnected or is an area code not representative of the breeder’s location, this could be a red flag. We find that most scammers insist on communication through only text or email. Any reputable breeder should have no issue having a conversation on the phone with a potential customer. Some scammers will claim affiliations with organizations or pet transport companies, you can follow up with the pet transportation company to verify the legitimacy of the ad. Many scammers rely on specific methods of payment as they are untraceable and nonrefundable. Red flags include payment via wire transfer (Western Union/Money Gram) or prepaid debit cards. To better protect yourself, pay with a credit card or use services such as PayPal where you are protected. Insist on a formal contract as a second form of protection. The contract should detail the method of transportation, time-frame, all costs and fees and a copy of the health certificate from a USDA accredited veterinarian. Be cautious of any seller who is out-of-town or overseas. It is much harder to verify legitimacy when you are unable to physically verify the presence of the animal you are looking to purchase. A reputable breeder will allow you to visit their location, meet the parents and spend time with the puppy or kitten. Ask for their facility location and if they are unwilling to give it to you, it may be a scam. Capital Pet Movers does not recommend shipping puppies or kittens under the age of 16 weeks. This is primarily due to their lowered immune systems and not having all their vaccinations to prevent them from contracting various diseases and illnesses, but most importantly, we believe it is just too young. However, you can ship pets as young as 8 weeks by air depending on the airline. To further protect yourself, shop around and contact the AKC (www.akc.org) or the Better Business Bureau for a local breeder, ask your family and friends for referrals. Visit the breeder, check their references, including their veterinary and do your due diligence before committing to any one breeder. Any breeder rushing you to payment or to purchase their pet should invoke a sense of skepticism. family a magical and happy holiday!